Bathymetric information plays a key role in selecting a suitable site for riverine fixed-site monitoring operations. To avoid blind spots, an effective site for side-looking sonar requires a continuous gradient. Vertical cross-sections of the bottom, extracted from the bathymetry, are a good tool for determining the slope of the gradient, which in turn determines the beam width that should be chosen. The acoustic beam should fit the water column without surface interference. Vertical river cross-sections are also a good tool for optimizing transducer aim. Ideally the transducer should be aimed such that most of the fish pass near the center of the beam. Bathymetric information is often also useful for other applications, e.g., habitat assessment or the placement of hydrophones in acoustic tagging studies. 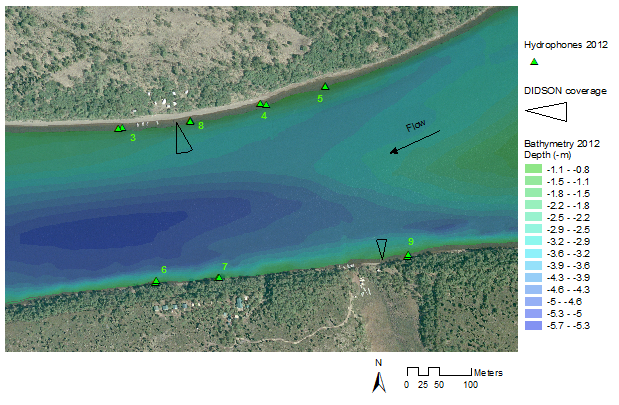 The example shown here is a bathymetry map generated from data collected with the vertical beam of a Sontek River Surveyor M9 ADCP system, georeferenced with an Ashtech Mobile Mapper 100 GPS, following preset survey lines, spaced approximately 15 m apart. The xyz point data were interpolated with ArcGIS Geostatistical Analyst’s kriging function. Bathymetry map of the Nushagak River sonar site, with an overlay of the coverage provided by the DIDSON sonars that are used to estimate sockeye salmon passage.